So the question you may be asking is why so many parts to this story? Yes I have a ton of images and stories posted over the years, but the big difference is looking through someone elses eyes as they see the canyon for the first time and what do they see. It really does bring a different perspective to the trip. When we last left you the tarp was up and the rain had begun, and the rain got heavier and the temperatures got colder as the night went on. By the time we got up the temperature on our thermometer was just over freezing It was a good feeling knowing that there was going to be a dry warm place to have breakfast and some coffee, times 2 because with the rain there was no reason to be in a hurry since we were camping in this spot for a second night. Also the G7 painting sites were not going to go anywhere and more of a concern would be getting our clothes wet on a cold day and not being able to dry them out on just the 2nd. day of our trip. The rain did start to ease up before noon so we had lunch to keep the bodies fueled and warm and off we went to the next locations. We stopped shortly at a George Agnew Reid site, but this too was no longer visible from the location he painted at due to the forest growth, but still visible from the river. With the water being higher, the usual way I go into the next locations would be a little tougher as we would have to push through the dense shoreline bush instead . First on the list was not a G7, but a A.Y. Jackson friend that he took there in the 50’s a famous painter in his own right, Maurice Hall Haycock. The pinpointing discussion on where he painted from was not easy. To get this shot we pushed through some very dense wet bush and assisted each other to climb on top and perch on a large riverside boulder that was about 3m tall made very slippery because of the rain. The larger boulder on the right is a key feature in the next location. It took us about 15 minutes to get to the Lawren Harris location, the footing was made much more difficult from the flash flood debris a few weeks ago. For Lawren Harris’s “On the Agawa” site the initial idea with this being the same week the G7 made their first Box Car trip was to be here for the “shadow” effect in the painting, at least it wasn’t raining. So once the site that he painted from was agreed upon, we had a discussion on the geographic features that created that effect in his painting. That actually is pretty easy to do with the sun charts and with the times I have been here before, but sadly not on this trip. Even though the weather was “off” they were still a happy crew to be here. Here is a time-lapse of the shadow from last year. So off to the next location, another Lawren Harris spot, but also a 1920’s photo post card that shows what the vegetation was like during the G7’s time here. You can see in the post card that the views they would have had from the tracks was pretty clear compared to 2018. The post card was taken right above this Lawren Harris location. Sue and Jim are quite diligent in trying to find exactly where they might have been when they painted. You can tell from the postcard that there was not a lot of bush at the time. When Jim did move to line up with the painting you could not see him well from where the above image was taken, but this does show Jim doing his due-diligence. The mist was starting to become rain again so we head back to camp for a warm fire and hot drinks. While walking back up and making plans for the next days paddle I expressed my concern about the 3rd rapid of our trip. I have paddled this rapid numerous times, but I have also lined it or carried some of the gear along the shore to lighten the load. This is a short, very fast, technical rapid where I have gotten into difficulties including taking on a lot of water, stuck sideways on a rock. and a swim while trying to take a remote censored self-image. My concern was rising water could make the rapid much more difficult, but also make it even more difficult to line along the bank with the gear. It did not take much discussion to make an extra long carry to get around it. Day 3 brought slightly warmer temps and the rain did stop by the time we were all packed up. When on a river I always put in a marker to measure what the levels are doing. The river had risen more than 15 cm from the night before so that was about 20cm in two days, so I was very happy with the decision for the extended portage. The carry went quick, but a lot more time than it would have taken if we had paddled. I did get to put the “Munter hitch” to good use to lower the boats and gear down to the river. As you can tell from the image after we got the gear down it was steep with really bad footing. Before starting the trip we had an understanding with Sue & Jim that they would walk anything over an easy Class II rapid while we paddled the gear down, due to their limited whitewater experience. It was not worth the risk should something happen. I would take the one canoe down solo then I would walk back up and tandem down with Sandi. The rapid in the “On the Agawa” location is very straight forward for an experienced white water paddler but for the uninitiated the hazards are very real and unseen. 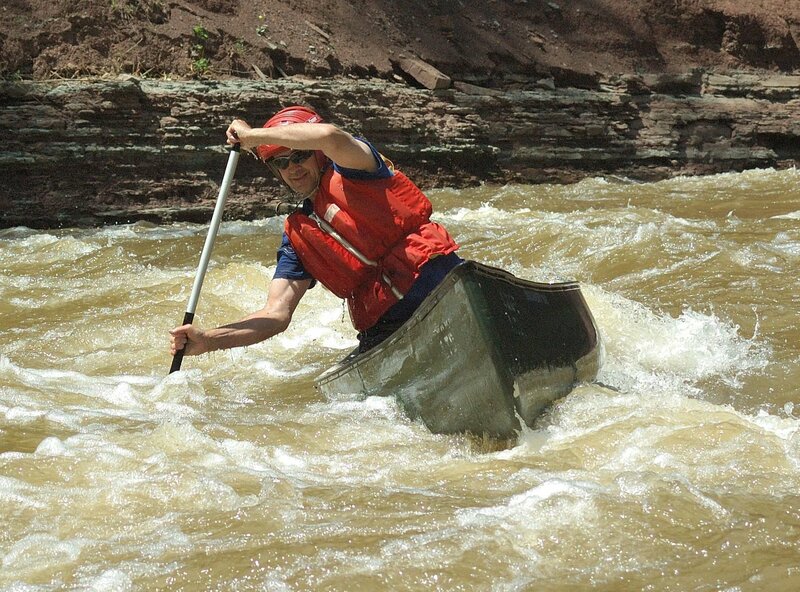 Since I solo most of my trips down the river, it was nice to have someone capture me on the river. Lining up to negotiate a sieve of boulders. Sue waiting patiently for us at the bottom. All together again we were ready to paddle through the Algoma rocks, Spruce and water, sketch CVII site. The conditions were not great so here is a short video from last years trip to give you the feel of paddling through the canyon. You will also see the cone hill feature in the Maurice Hall Haycock painting. Right after this we all put on our helmets for Sue and Jim’s first Class II rapid test. It is just over 400m long and we explained what they were going to see and do and the hardest part was at the bottom, and not so much as it getting “bigger” but the fact there are strong currents and eddy lines. We Stopped in a pool half way down and reviewed what we did and go over the second half again and for WW rookies they did excellent! and their relaxed disposition will do them well later this day and the rest of the trip.